Sure enough, our beloved Golden Retriever, Lady, had died in her sleep. We’d had her for 13 1/2 years, after the neighbors abandoned her, the vet literally brought her back from the brink of death, and I nursed her for many months. 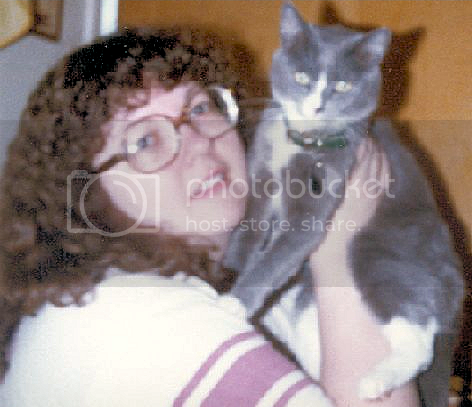 At the same time, my beautiful T.C., pictured with me above in 1982, was dying. And I was selfishly prolonging the inevitable. So I took T.C. to the vet the day after Labor Day. When the vet acknowledged that she was indeed dying and probably fairly miserable, I knew I had to take Clint’s advice. Walking out to the car without her remains one of the most difficult moments of my life and even though that was 1998, I still miss her every day and am fighting the tears as I write this. You see, she was the first pet I ever had. Growing up, our parents never allowed us to have any pets. Ironically, one of the first things my sister and I did as adults was adopt one. So T.C. remains in my heart. I’ve loved so many other pets since then, including these two spoiled little brats lovies, but T.C. will always remain, in some ways, the most special. Ohhh…What a beautiful (though bittersweet) post. It always makes me sad to even think about the day our beloved pooch will pass away. He’s now 5 years old and I dread the day he leaves us. I wish he could stay a young, healthy pup (yes, I still call him a pup) forever.